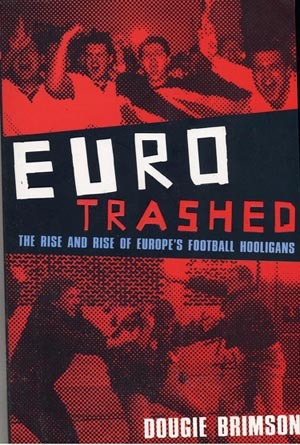 "Eurotrash" would seem to be a more appropriate title, since it deals with your basic violent morons running around the continent. Brimson has several books dealing with hooliganism under his belt, but this offers a review of the continental scence, from an english perspective. Much of the chapters were written by locals, and usually display the bias toward their own personal club favorites. Most chapters are a monotonous account of various fights among hooligans, and everybody blames the police for making it worse. To be fair, Brimson has a few introductory paragraphs in each section, which introduces the local scene and does a decent job in pointing out the unique aspects. Brimson feels necessary to point out that this is not intended to "excuse the behavior of English fans", although it mostly reads like that. I think most folks believe that if you show up in a mob in a foreign country, get rip-roaring drunk, behave boorishly and destroy property, you shouldn't be complaining if the police give you a close encounter with a truncheon. The last section is quite interesting, as it deals with Turkey, which is obviously on the crapper list for all English fans. It centers mostly with the murder of two Leeds supporters in Istanbul. The Turkish writer has a short note which basically says "when you're in my country, it's my rules." He gives the Turkish press accounts of insulting English behavior. This is followed by a rather longwinded english account, an eyewitness to the murders. He claims that none of the Turkish accusations are true, and basically it was a vicious unprovoked attack by uncivilzed savages on English gentlemen. The truth is undoubtedly somewhere in-between. Overall, like most books on the subject, there is an underlying current of approval of the whole hooligan scene. Somehow because evil corporations have usurped control of the game and filled the stands with uncaring middle class namby-pambies (usually in a Manchester United kit) the violence is understandable and even justified under the guise of die-hard support. It's not.